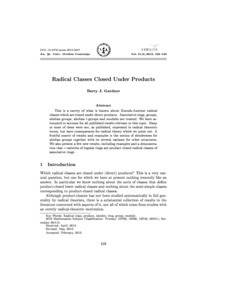 This is a survey of what is known about Kurosh-Amitsur radical classes which are closed under direct products. Associative rings, groups, abelian groups, abelian ℓ-groups and modules are treated. We have attempted to account for all published results relevant to this topic. Many or most of these were not, as published, expressed in radical theoretic terms, but have consequences for radical theory which we point out. A fruitful source of results and examples is the notion of slenderness for abelian groups together with its several variants for other structures. We also present a few new results, including examples and a demonstration that e-varieties of regular rings are product closed radical classes of associative rings.